I remember Hubbell Hall very well, especially for my calculus and engineering mechanics classes. The professors were very smart, but a few were also a little quirky. One in particular was Dr. Stipe (not sure of name now). Most were tough and graded accordingly; however, I am sure all would agree, we all got a tremendous education for the next sequence of classes. Climbing up those steps in the winter for an 8:00 a.m. class was not much fun, especially when the snow was falling and the wind was blowing. If I remember right, in the winter, the classrooms were either too cold (at the first class in the morning) or too hot (later in the afternoon). Hubbell Hall is of historic importance to Michigan Tech, although the young students will never have the pleasure of having a class in that building. Too bad, but that’s progress. It was interesting reading the comments about old Hubbell Hall; I was surprised that it was also used for biology and chemistry. When I was on campus, I had math and physics in Hubbell. Chemistry and comparative anatomy (sharks, cats, etc.) were in Koenig Hall and botany and zoology were in the old Hubbell School (as well as some econ classes). I also remember the creaky, well worn, dished steps and the thundering of engineers’ boots coming and going for classes on those old wooden steps. It’s too bad such an iconic building had to be torn down. The note about the diagonal path to the building reminded me of what was tried when I was there. Of course, everyone took the shortest route to classes, so there were well-worn dirt paths across the grass. One year, they fenced them off and replanted grass and everyone had to take the “long” way on the paved sidewalks. Once the grass grew up, they took the strings down. It didn’t take long before the well-worn dirt paths were back. Several years ago, I noticed with amusement that the diagonal paths were all paved. 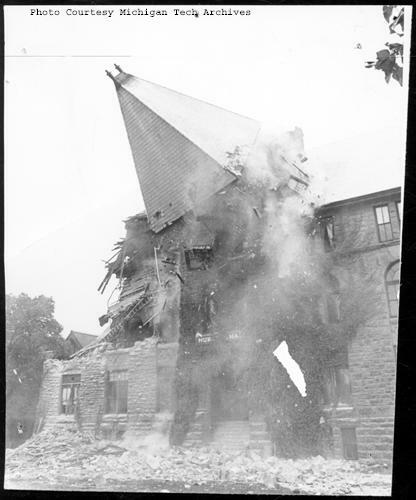 My vivid memory of Hubbell Hall was a course on vibrations taught by Paul Shandley at 1:00 p.m. during the spring of ’57 or ’58. The classroom was full, the heat remained on, and there weren’t enough open windows, resulting in a “sack lab.” Tough to remain awake. The thing I remember most about Hubbell Hall: it’s the place I was sitting when we learned that President Kennedy had been shot. It was the Friday before Thanksgiving break, and since I was on the Lode staff at the time, I headed for the office in the Union. One of the staff had left for the Mining Gazette office to monitor the newswire since it was the best link to what was going on. I sat though many math and physics classes and physics labs between 1959 and 1964. It always seemed like the building was either too hot or too cold. I had classes in Hubbell Hall—math and physics, I believe. My freshman year started in 1939. My professors were Burnie Bennetts (Paul Bunyan expert), Doc Rose, Toby Stipe, and more, I’m 92 years old, left school to join Uncle Sam’s Army Air Force in 1942, returned on the GI bill in 1946, and graduated in 1948. 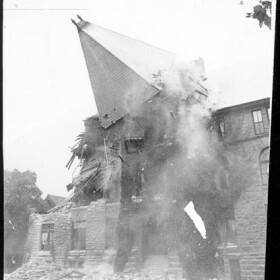 I remember getting a mailer asking about destroying Hubbell Hall or not. I thought it was a valuable landmark, and so I voted, to no avail. I missed your request for Hubbell Hall stories but I wanted to tell you mine. I had Dr. Stipe for calculus and did pretty well. I especially remember his quickies at the beginning of each class. So, when I was asked to teach freshman math in 1957 for $0.75/hour (I was paid for 15 hours/week for the 5-credit course; I had to prepare and grade exams), I used Dr. Stipe’s model and my students did very well on final exams. I was introduced to the teaching profession from which I retired after forty years at U of M and MSU. My professional career started in Hubbell Hall. I remember the old building fondly. I had a calculus class there during winter term of ’61. Unfortunately, it was at 8:00 a.m. We would walk through frigid temps early in the morning and arrive chilled to the bone, only to find the steam heat rolling along and the temp in the classroom similar to that in a sauna. Needless to say, it was very hard to stay awake in those conditions. I was sorry to see the old landmark go. 1. My first class, 8 a.m. Monday morning, September something, 1953, was algebra (I don’t think we started calculus until sometime later those days) taught by Howard Anderson, one of the best math teachers that I encountered at Tech. As he read off the names of those in that section, one still sticks in my memory: Kenneth Exworthy. He was also an EE major whom I got to know quite well during our four subsequent years of sharing many classes. I think he was on the Dean’s List every term, played string bass in the Starliners, and was from the same county of Marinette, WI, as I was. 2. I had to make up a lab that I had missed, taught by Dave Chimino, because of a Glee Club event. That particular lab exercise was to determine the frequency of an audio tone using whatever hardware was needed. Dave had the tone sounding as I entered the lab, and I said “That sounds like middle C.” I didn’t have perfect pitch, but it turned out that I was right and Dave was suitably impressed. Over the years, my wife and I had visits from Dave many times in Ann Arbor, where he took summer courses, and later at Lawrence Livermore National Laboratory, where he spent two summers developing computer movies for teaching physics as part of a program I had started. 3. After getting an MS (Nuclear Engineering) of U of M, I returned to Tech where my new wife and I spent our first year of marriage with me as a physics instructor. I shared an office on the first floor to the right of the main entrance with Gilbert and Hinzmann. It was somewhat nerve-wracking for me handling the problem-solving sections I was assigned, since quite a few of the students were older than me. But altogether it was a well-spent year after which we returned to Ann Arbor to continue our studies.